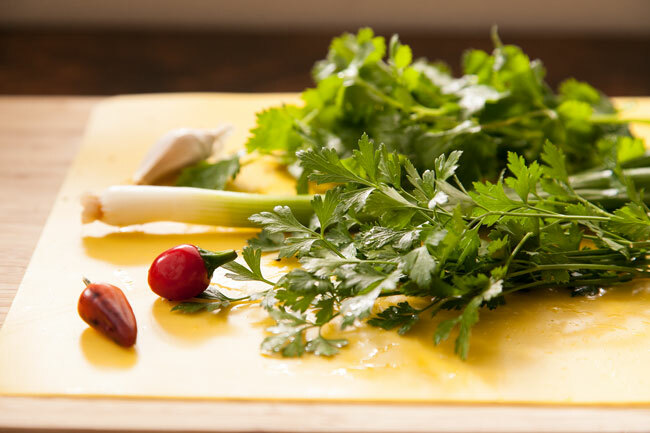 If you’re a food blogger, you’ll begin by taking an artsy sun-drenched photo of your ingredients. Those are home-grown peppers and parsley from my front stoop, and you better believe they have real flavor! If you’re not a food blogger, you get to go straight to the fun part: jamming lots of tasty vegetable matter into a jar! I roughly chop the scallion to make it fit, and I give the hot peppers a quick mincing to avoid any over-sized spicy bites. Everything else just goes straight in! If you’re not familiar with the mason jar magic bullet, this is where the magic happens. Effortless prep, ready for storage, practically zero cleanup! Here it is in action! I started by stirring a generous spoonful of the chimichurri into the water while cooking a pot of brown rice. This lightly seasons the grains with a first layer of flavor. 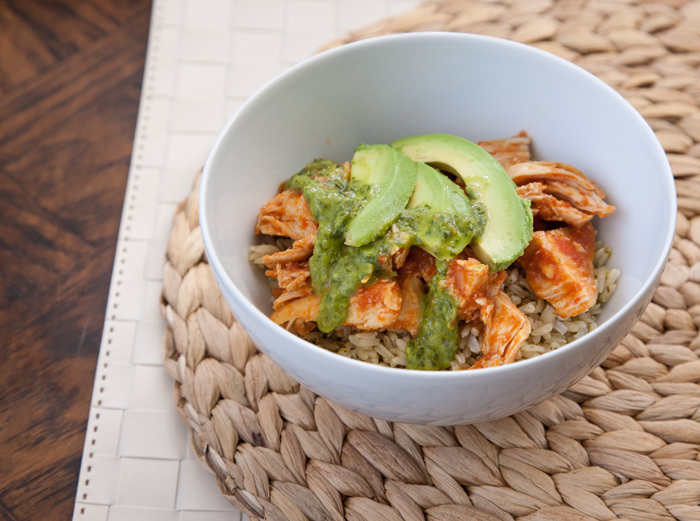 Then the rice went into bowls with some simple shredded salsa-braised chicken breast out of my pressure cooker (so convenient, life changing, I promise you’ll hear about this soon my fellow Instant Pot fans [editor’s note: here it is!]). Then sliced avocado, and, obviously, more of that irresistibly tangy+garlicky+herbaceous chimichurri. Peel and smash the garlic clove, roughly chop the green onion, and mince the chilies. 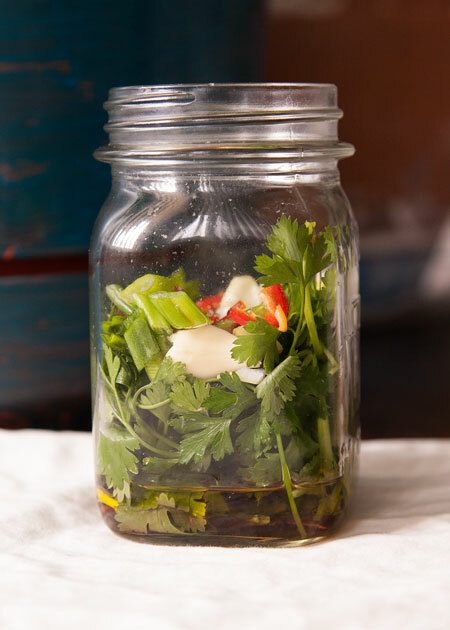 Add these, along with the rest of the ingredients, into a pint-sized regular-mouth mason jar. Attach the jar to a standard blender base assembly with blades and gasket. Invert the sealed assembly onto a blender, and blend until desired consistency is reached. Chimichurri is my favorite! I love that you can jazz up any plain protein or veggies with this flavorful sauce. Me too! I’ve been eating this stuff on everything. Newest discovery: brushed onto corn on the cob!! How long does it stay good in the fridge ? 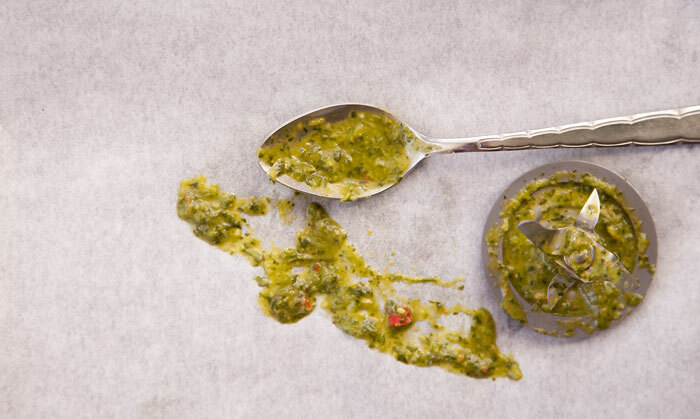 I’ll say use within 4 days (backed by Oregon State Extension food safety guidelines for pesto). 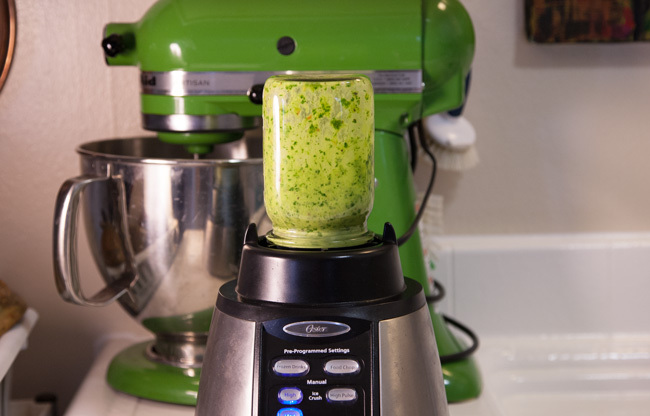 It’s tastiest when freshly blended, but still OK until the herbs start to lose their bright-green punch.